I'm good at computers mostly, but I have no idea why all the photos in this post are weird. So just have some fun turning your head in strange ways. It'll limber you up! Do y'all remember how cool it was in like 4th grade to have a Timex digital watch. I remember the hierarchy: Timex digital > Timex digital lap watch > Timex Indigo > Timex Ironman > Timex Ironman with a metal strap! We didn't even know what Ironman was! But we knew that it was awesome, and you "had to have the Ironman". And the coolest kids were able to exactly synchronize the hour alarm to the class ending bell. Man that was cool. This last Sunday was race 4 in the MEC run series. Pretty much the greatest bargain race series ever. I missed races 2 and 3 (2 because I didn't want to get up, 3 because of no run month) so I was ready for 4. And by ready I mean on time, or slightly early. Now Victoria 70.3 is this coming up Sunday. So I was planning to take it a bit easy in the 10k. No sense "laying it all out there" in the wrong race. That is, until I was 200m in and got this delightful encouraging tap on the bum from my friend Kim and her magnificent husband Rod. Rod is a beaut. An absolute beaut. We worked together for years and I guess he saw me lined up in the start gate and decided to send his wife to commit a minor but very welcome sexual assault advance. I'm guessing I wasn't hard to spot in my "Come With Me If You Want to Lift" tank and fashion forward head wrap. Rod is a legacy runner from a time where running was a fringe sport. And he's unbelievably impressive. Rod could use an Ironman Timex to actually do things like pace his run (see how I tied all that foreword ramble into the body? Impressive right?). He just knows how to run, and he's amazing to watch. So imagine my surprise and delight when Rod saddled up right next to me for the next 9.8km. He set a core-of-the-earth rock solid pace (seriously, the most steady pace I've ever ran, ever). Told me amazing stories about his runs. Told me amazing info about how to get better at stuff. Made me laugh, and pointed out the occasional cute bum or two (just kidding Rod, and Kim....). With Rod by my side, and totally unintentionally, I set a personal best 10k of 53:50. Blazing fast? Absolutely not. But just like a used car is "new to you" this PB is something I'm proud of. And more importantly, and mostly thanks to Rod, I'm going into Victoria 70.3 with a whole new mental attitude on how to pace myself, and a new appreciation for exactly where my fitness is notwithstanding no run month. So Rod, and Kim, to you both. Thank you. Also a huge shout oot to some of our other honorary Team Unicorn Sparkle Adventure crew. 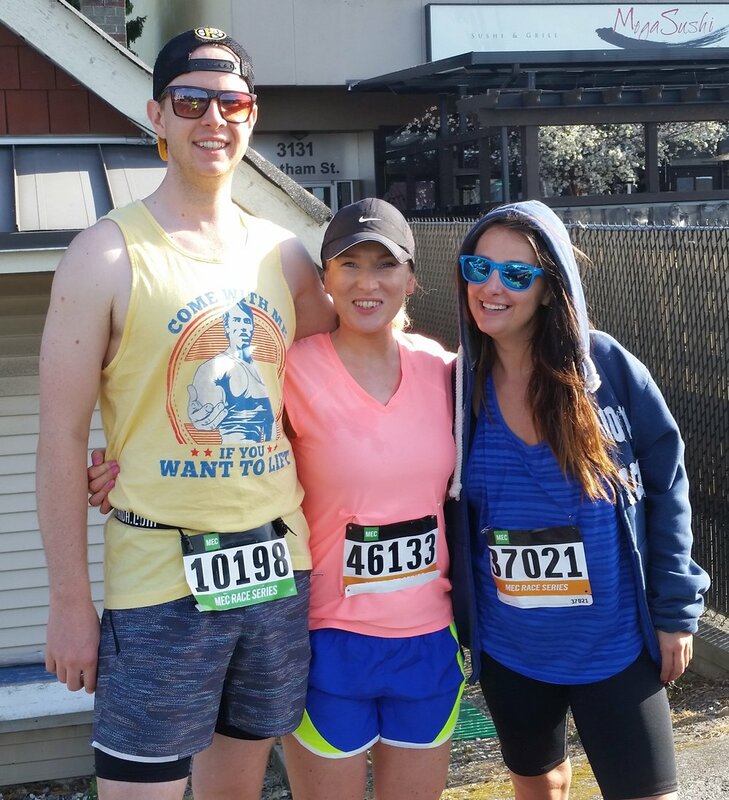 Ali and Cait crushed the 10k. Maeve turned in a crazy respectable time in the half marathon on what was a blistering hot day. And Amanda, our little Amanda, absolutely destroyed the half marathon course with an official 2:06:16 in her very first half marathon ever! I am so incredibly proud of everyone. It was an absolutely fantastic day. So here we come Victoria 70.3. Team Unicorn Sparkle Adventure is ready for you, I hope you're ready for us.